After many blog posts based around teaching reading in the 2014 National Curriculum, lots of people have enquired about assessment. As a school, we've had a long journey about assessment in general and are by no means *there* (wherever that is!). 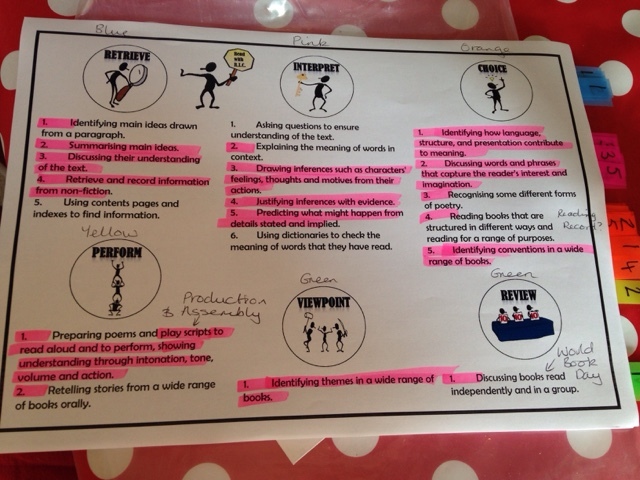 Something we, in year four, have found particularly useful are these reading objective sheets for key stage two. I envisage them being used in many different ways, some of which I have outlined below. We have used these sheets in our planning to ensure that we are covering all of the objectives throughout the year. All the objectives for key stage 2 are split up into the RIC logos and so can be easily linked to the whole-class plans in the Google Drive folder. Also, these sheets can also be used to save time writing objectives, as I know some schools still have to each lesson. This year, my class have been writing the RIC word which we are focusing on each lesson. For example: Choice or Viewpoint. However, next year I'd like to stick one of these in each child's reading book and they write the RIC objective and the number underneath. For example: in year 4, if we were retrieving from fiction and non-fiction texts, children would write 'Retrieve 4' at the top of their work. When it comes to making a judgement, it will be quick to see their work for each objective in their book. As we head towards the end of the year, these objective sheets are proving useful for assessment too. If you are doing carousel guided-reading, these can be edited to create assessment documents for teacher group sessions. However, if you've made the move to whole-class guided reading, you will have a lot of written evidence over the year to cover each of the objectives. The objectives sheets could then be used to check the extent to which groups of children have achieved the objectives. I have included an example below from a recent reading moderation with an explanation below. Highlighted number = some evidence of achieving the objective. Highlighted objective = objective achieved independently across a range of contexts. For moderation purposes, I used different coloured mini post-its to show which objective under the RIC headings was on that page and put notes of extra things to consider. This made it quick and easy for my colleagues to moderate my judgement. We only did this for one child's work as it is a lot of effort! From doing this for only one child, it became clear which objectives we still need to cover before the end of the year so was a very useful exercise. Stick it in the front of the child's book - highlight when they've achieved an objective. You can then use it at the end of the year to make a best-fit judgement according to your assessment system. Complete for groups in the class to judge the extent to which those children are covering the objectives, a bit like how APP was meant to be used! Children have a copy in their book. They keep track of which they think they've achieved throughout the year as you teach. To download these objective sheets, including editable versions, and all the other RIC resources for free, click here. If you have any other ideas for using these objective sheets or for assessing reading in the new curriculum, get in touch in the comments below or on Twitter. We are using your reading with RIC resources very successfully and we complement them with a termly PIRA reading assessment. These are extremely useful as they break down the questions into the RIC areas, therefore providing an excellent diagnostic tool. I realise many teachers like to avoid this 'summative' type assessment now but it provides further evidence of the children's learning. I'm going to give these a try - it looks like a simple way to keep a track on reading coverage. Thanks for sharing! I am very much enjoying reading your blogs about reading and how to improve reading skills. We are developing our reading system based on your ideas - I will let you know how it goes! Hi, love all these amazing ideas. I was just wondering do you do any summative assessments and if so what you think is a good way to go with that. Thanks!! Thanks for your comment. All comments are moderated before they are posted so may take a short time to appear on the page.